By anyone's standards, these are odd looking fish. They can be found for sale from time to time in good retailers but you have to look hard to spot them if they are in a decorated tank. They are very inactive fish; their twig-like shape and camouflage conceal them most effectively against bogwood or similar backdrops. Inactivity aside, the fish will stay visible if housed in a dimly lit situation with peaceful slow moving fish. The biggest problem with keeping Twig Catfish is fluctuation in water quality. I have seen these fish die after a fairly "old water" tank was given a 25% untreated water change. The 3 individuals were simply found dead the next morning although the tank contained a number of tetras and a large shoal of Paraotocinclus, the latter of which survived, looking completely unaffected. 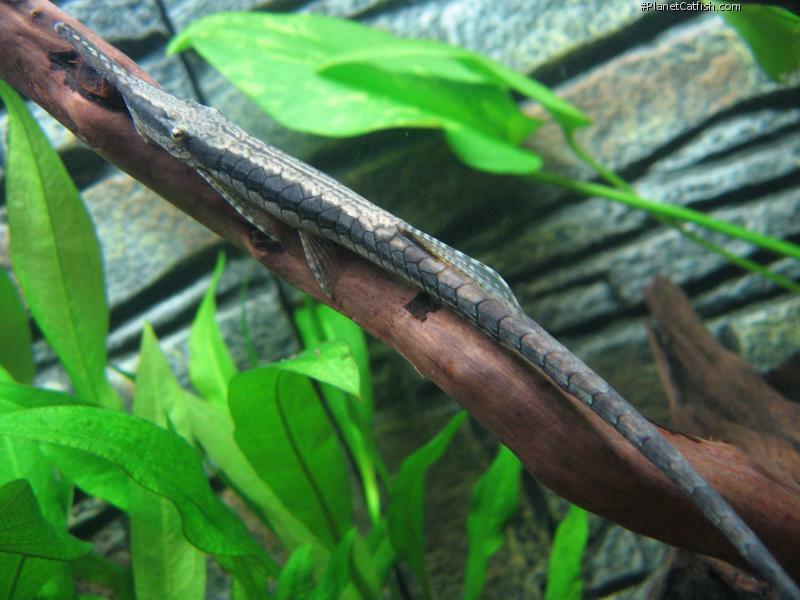 The fish is an algae eater although much prefers eating algae off long plant leaves and wood rather than the aquarium walls. Care is needed when moving these fish as their snout-like anterior protuberance is prone to bumps and knocks and will more often than not become infected if damaged in transit. There are nearly 60 species of Farlowella and also a few related genera (Sturisoma especially) that look very similar. As these fish are almost always wild caught and imported, you can find a rarity in amongst large shipments from time to time. Oddly you never see Farlowella species for sale smaller than around 3-4"; perhaps the youngsters do not travel well? So you'll just have to take on the (not inconsiderable) challenge of breeding these elegant sucker-mouths to find out what juveniles look like." Etymology Named after W. G. Farlow, from Harvard University. This specific epithet refers to its striped (vittatus=striped) appearance. Size 225mm or 8.9" SL. Find near, nearer or same sized spp. Identification There are at least 25 [Retzer & Page, 1997] species of Farlowella that, in the main, look very similar. The species was identified by its distinctive rostrum and ventral plates arrangement. In particular having two rows of plates on the ventral (belly) area. Sexing The male's "snout" is broader and when mature sports small bristles called odontodes. This is clearly shown in one of the images above. The female has a thinner snout which always remains smooth. General Remarks For those collecting these fishes in their natural habitat, it is worth noting that several junior synonyms exist that are found in different biotops. Farlowella angosturae Martín Salazar, 1964: Type locality: Caño Largo al oeste de Cuidad Bolívar, Edo. Bolívar [Venezuela]. Farlowella agustini Martín Salazar, 1964: Type locality: Una quebrada límite entre los Estados Cojedes y Carabobo, carretera Campo Carabobo Taguanes, afluente del río Chirigua que a su vez lo es del río Pao [Venezuela]. Farlowella guaricensis Martín Salazar, 1964: Type locality: Río Guárico, en el puente de Uverito, carreteria San Juan de Los Morros a Ortiz, Guárico [Venezuela]. Farlowella roncallii Martín Salazar, 1964: Type locality: la quebrada El Ahorcado Aguirre, afluente del Río Tirgua Carabobo [Venezuela]. Distribution Orinoco River basin: Colombia and Venezuela. Other Parameters Attention to water quality is essential for the long term prosperity of this species. Feeding Green and soft brown algae, cucumber and lettuce. Furniture Bogwood, particularly tall, spindly root-like structures. Tall plants such as Vallisneria or Amazon swords. Roof slate if you can get it. Compatibility Peaceful, to the point of being timid. Not the most active fish, it can spend much of its time sitting perfectly still. Suggested Tankmates Tetras or Rasboras are best. Avoid fast or "nippy" fishes such as Danios or Barbs. Will do well with Corydoras catfish, but larger catfish or cichlids are to be avoided. There are 138 registered keepers, view all "my cats" data.